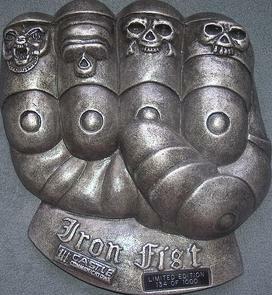 In 1994 Castle released a special metal fist package, each fist was individually numbered. It is said to be made in 1000 copies but so far I have never seen a number over 500 so I think only 500 were made. The CD was inserted at the back of the fist and it was the Castle Calssics with a special gold CD. Over the years some CDs have disappeared and therefore they are sometimes replaced with a later pressing, for example the Essential remastered version. The whole thing was also originally packaged inside a white paper box with a sticker, very similar to the box that also conatined the Griffin metal skull for the Fistful of Aces. Over the years I have seen also two copies that says there were 2500 copies made. In one case it seems very likely the numbers have been swapped between a copy of the Fistful plaque. The other case is a copy that was sold on Ebay in 2016. If there actually was a run of 2500 copies wouldn´t there be more copies out there for sale? There are plaster casts of this metal fist. A seller on Ebay said this in June 2007: "I used to work at a record Label called Griffin Music in the USA and we distributed a number of Castle titles within the USA and worked with Castle for this Limited Edition Sets. The set was sculpted by a guy called Bruce Webber out of Chicago. This paster cast is made from the original to enable a metal cast mould to be made. This is the only one of it's kind as far as I'm aware. It's been sitting in my basement sine 1996. This is the one and only original Plaster mould that was created for the set before it could be made into the cast iron set. This limited edition sold out years ago with the release being in 1995. A true collectable for any Motorhead Fan".